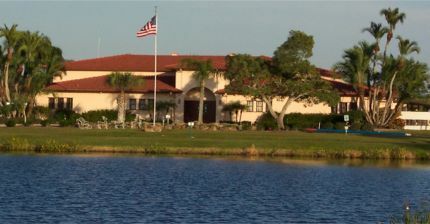 Spanish Lakes Mobile home park is located on the Gulf coast, with Sarasota only minutes to our north and next to Venice. We are conveniently located to most airports; only 34 minutes to Sarasota-Bradenton International Airport, and approximately one hour's drive to both Tampa International Airport to our north and Ft. Myers (Southwest Florida International Airport) to our south. The park is only minutes to churches, hospitals, doctors, shopping, restaurants, and golf courses. To enjoy the gulf waters and magnificent sunsets, Nokomis Beach and the North Jetty are a very short distance away. The arts, cultural & historical events and entertainment abound in Sarasota to the north, and Venice to the south. Spanish Lakes is an active, over 55 community…something for everyone…dances, pot luck suppers, exercise classes, card nights, dance classes, painting classes, quilt group, craft group, book club, golf group, shuffleboard, bocce, and horseshoes, just to name a few. The clubhouse, which is the hub of all indoor activities, includes a Library, Billiards Room, Craft Room, Meeting Rooms, Dance/Function Room, Stage and Kitchen. The Community Covenant Church offers non-denominational worship services every Sunday in the clubhouse to which all are invited. Outdoor amenities include a heated pool, bocce courts, shuffleboard courts, and horseshoe pits. Although the park (396 homes) is approximately 30 years old, most homes have been remodeled and upgraded over the years. Re-sales or rentals (if & when available), are posted on the bulletin board inside the clubhouse. They are also listed on this website. They are available for viewing by contacting the realtor, rental agent, or home-owner on the listing. Please do not contact the website for rental or sales information. Spanish Lakes is the 4th lowest lot-rental park in Sarasota County. Monthly lot rental fees include water/sewer, lawn mowing, tree trimming, weekday yard waste pick-up, weekly trash/recycle pick-up, basic cable television, and use of park amenities.